People in Southgate are expressing anger over becoming victims of recent vandalism. One victim says damage to her vehicle was caused by a hard object that was thrown while it was parked in the street. Victims say there were incidents on local streets including Chestnut, Phelps, Trenton and Burns over the weekend. 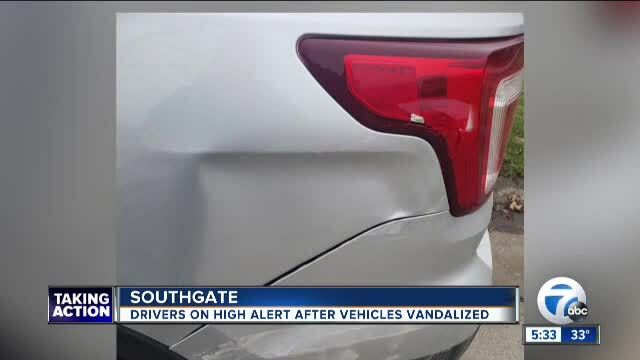 SOUTHGATE, Mich. (WXYZ) — People in Southgate are expressing anger over becoming victims of recent vandalism. One victim says damage to her vehicle was caused by a hard object that was thrown while it was parked in the street. Victims say there were incidents on local streets including Chestnut, Phelps, Trenton and Burns over the weekend. Sue Poier tells 7 Action News her daughter’s Jeep Wrangler will need the back gate fixed after a clear hard object struck it. “I would like them to figure out what people are doing this,” says Sue. Next door to Sue’s home, Franci Childers says she was also targeted when her Ford Explorer was damaged during a hit and run. Reports have been made with Southgate police. However so far they aren’t commenting. Vehicle owners are urging anyone who knows who is responsible to turn them in.